Toys, toys everywhere!! Ug, what's a Lazy Girl to do? The kids don't seem to care. My girls are adopted from foster care. One of the things we learned in our "adoption training" was to keep things simple. And we did. But not enough. I remember the first few months they came to live with us it was chaos, not JUST because of the toys, but that was a big part of it. It took me a while to even really see that the smaller amount of toys we had were simply overwhelming for my girls. Now your kids may not be adopted and have the issues that can accompany that experience. 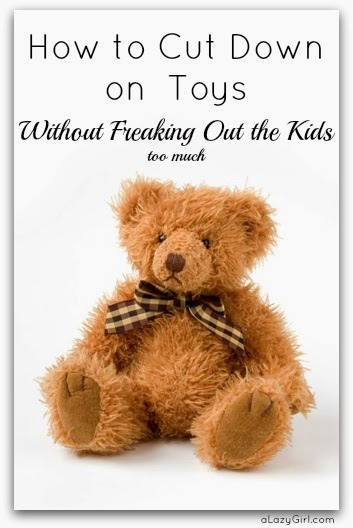 But it still is possible that your child is overwhelmed with "stuff". Have you ever seen your child play with something for a day and then throw it in to the bottom of the toy box, back of the closet or even into the trash? I have and I believe when they do this stuff they probably have too much. What to do? Kids are ALWAYS begging for more and as a "good parent" we often want our kids to have the newest and best. Here are a few of my ideas of how we have scaled it down. We are not perfect and toy overload hits us in the head every once in a while but if it does, we just get back on track. 1. Help your child clear out any toys that they no longer play with. If they have outgrown toys or may long longer like something either donate these items or have a garage sale. If you kid is struggling with this let them keep the proceeds from the toys sold at the yard sale, it may easy the pain. 2. Help your child sort out their favorite and least favorite toys. Maybe do 3 piles: Favorite, Like, Kinda Like. Give them a maximum amount they can put in the Favorite and Like, let them put as many as they want in the Kinda Like Pile. 3. Keep the Favorites. Buy some organizing baskets to hold these toys or shelves to put them on in their room. 4. Clear a spot in the garage or a toy closet for a toy library. This is the spot for the Like Pile. Let them trade out toys they have in their room (Favorites) for these toys. Toys in Toys Out, this way they never have more than a certain amount in their rooms at one time. 5. Box up the Kinda Like. Let them check out this box once a month (make a date on the calendar) and trade anything from it to go in to their room or in the toy library. Rule is: if something stays in that box for more than X number of months (you decide) it goes into the giveaway or sell pile. I find this kind of system keeps everything "more new" and interesting for kids. When they have too much the toys become boring and even overwhelming. What to do about birthdays and holidays? Birthdays and holidays can bring in an overload of toys. Personally, I dread it. So we have taken a couple of steps to make sure that doesn't happen. 1. Re-evalate your own feelings and values. I think sometimes we go overboard for ourselves, not our kids. Buying toys and gifts makes US feel good. Make a family policy that only one or two gifts is given per person. This way it becomes a habit and we can relaese that stress of wanted to give too much. 2. Start giving "experiences". Give your child lessons, visit a farm and make jam together, dress up and go to a fancy restaurant, go to an amusement park, volunteer. Our family loves consumable gifts. In doing this you create family bonding and memories instead of just clutter. 3. Let Family and Friends in on the News. I know, I know.. this is the worst. Grandma comes with a truckload of presents, friend want to give toys. Stand your ground. Tell them no. And if that doesn't work, at least tell grandma that she has to keep them at HER house!! 4 What to do with the gifts that DO slip through. Again, stand firm. The rule is Toys In Toys Out. So if you child does get gifts, toys in their room or toy library (not the Kinda Like Pile) have to go to the donate or sell pile. Once your family makes a habit of less gifts and toys coming into the house this process will get easier, I promise! Do you have too many toys? How do you manage it? I love this post! I am a big fan of minimal toys. After several YEARS of decluttering, my kids are used to a more minimalist approach. It really does make for happier kids, not to mention a happier mom! Thanks Sarah!! It does make for a happier, less stressed mom. This year we started asking friends of our children to bring a donation to a charity our child chooses. We started it with our youngest (age 2) and our oldest begged to do it for her birthday. The family still gave gifts (Mom & Dad, Grandma, Aunt, Sibling) so the child got 4 gifts and then their friends all brought donations to a local animal shelter that needed new housing. Then the day after the party the kids took the money to the shelter and everyone went on and on about how good they must feel and how giving they were which really encouraged them. Because they still got a few gifts from family they didn't feel that they missed out and now even some of their friends are asking for donations!